Feeding a raw puppy food diet to your little Rascal is a great way to ensure that he grows up healthy and strong. Raw food provides abundant nutrition in a form that dogs are designed to digest quickly and easily. Preparing raw food for your puppy isn't as easy as pouring kibble into a bowl, and there is a fair amount of time and effort required on your part. 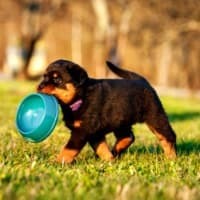 The most important thing you must get right is the balance of nutrients in your puppy's meals. Puppies grow at a phenomenal rate and have very specific nutritional needs, if the food they get isn't correctly balanced (for each individual puppy, taking into account age/breed/sizes/health) it can lead to health problems, both short term and long term. If you're truly interested in feeding a raw puppy diet, don't let this put you off! There are some simple guidelines that will help you make sure your pup is getting what he needs, taking it one step at a time. Of course, as with any type of diet, there are pros and cons to feeding a raw puppy food diet. It's important to know what they are so that you can avoid problems that might otherwise happen. Also, do enough research to feel comfortable in your decision. There is a huge amount of information on this page and it's all important. If you're new to the idea of feeding raw puppy food I'd recommend reading from the top all the way through, and if you like what you've read, bookmark this page so that you can come back to it when needed. Why feed raw puppy food? This is a common, and fair, question. After all, the majority of dogs and puppies today eat a commercial diet and feeding raw puppy food is not 'the norm'. But this type of diet IS growing in popularity, you may even recognize the acronym for one method of raw feeding which has become fairly mainstream - BARF (Bones and Raw Food). In addition to the BARF diet, there is also a method of feeding raw called the Whole Prey Model. The main difference is that BARF diet can include some vegetables, fruits, eggs, dairy and supplements, while the Prey Model ONLY includes a variety of raw meat. Of course there are pros and cons to every type of diet and there are also a couple of drawbacks to feeding raw food to dogs and puppies. The most common ones are the health concerns over bacteria in raw meat, and the difficulty of creating properly balanced meals. The risk of illnesses such as Salmonella or E-Coli associated with raw meat do exist, and we are at more risk than our dogs when feeding a raw diet. Dogs have a digestive system designed to eat raw meat and a healthy puppy or dog is able to cope with the majority of bacteria it contains. Feeding human-grade, fresh meat can help limit the bacteria at the source. In order to keep ourselves, and our families, safe it's very important to follow good hygiene precautions. If possible have separate cutting boards, utensils and prep areas for raw meat products and always be sure to wash everything thoroughly in hot, soapy water after use. Wash your hands regularly and often. Unless your family is vegetarian or vegan, I would be surprised if you didn't already follow all of these precautions. It's not a big deal as long as you use common sense. While creating well-balanced, nutritionally appropriate meals for your puppy definitely takes some research, effort and a little bit of math, it's not rocket science. This page has the information you need to feed your puppy what he needs to grow up healthy and strong. 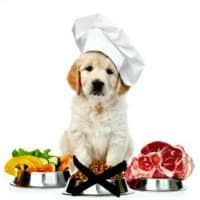 Raw puppy food recipes can be as straightforward as combining muscle meat, organ meat and raw, meaty bones (you'll find out more about these here). Or you can add vegetables, fruits, eggs and other ingredients to build more varied meals. The second option requires a little more work, but as your aim is to provide your pup with a balanced diet over a period of days or weeks, every single meal doesn't need to include all the nutrients. I know I don't cook every meal for my family with the aim of giving them all the vitamins and minerals and such that they need on one plate. But over a period of days they'll have enough variety to get the nutrition they need. The same principle applies here just fine. All of the above are 'buzz words', but they're also names that apply to slight variations of a very important concept... feeding your dog a diet that his body was created to eat. Dogs have a digestive system that was originally designed to eat raw meat... raw carcasses to be exact. That includes the meat, bones, muscles, organs and so on. Anything that their prey had digested would also often be eaten when the dog ingested the stomach contents, and fish, eggs, grasses and berries were also eaten from time to time. Dogs have teeth and jaws designed for ripping and tearing, a short digestive tract (compared to other mammals) and strong stomach acid. With these characteristics, raw meat and bones are easily ingested and then digested, and the nutrients are absorbed efficiently as they pass through the digestive system. The strong stomach acid is also effective in killing many bacteria naturally found in raw meat. The acidity level is determined by the meat protein portion of any diet. When Rascal is fed a commercial diet his digestive system doesn't function optimally. In order to digest the non-raw ingredients (and to cope with the high carbs, plant-based proteins, grains and other things) his stomach acid becomes more alkaline. This causes slower digestive processing time (the time it takes from food-in to food-out) and reduced effectiveness against bacteria. Feeding both raw meaty bones and commercial food at the same time can be dangerous because bones and raw meat need a strong stomach acid to be digested properly, and keep bacteria at bay. What Goes Into A Raw Puppy Food Diet? The basics of a raw puppy food diet is pretty simple in terms of ingredients. Protein is the most important part of any puppies diet (or dog's diet) and your pup will get high quality, highly digestible animal protein from the raw meat in his meals. Raw meat is the basis of the BARF diet, and the sole ingredient in the Whole Prey diet. Creating or choosing several different 'recipes' which use a range of different items (whether you're purely feeding raw meat, or are adding vegetables, fruits and other ingredients) is the best way to ensure your pup gets a really well-balanced diet. There are different types of raw meat that you need to include in Rascal's diet, and they need to be offered in a fairly specific ratio. The quality of raw meat you feed your puppy is hugely important. 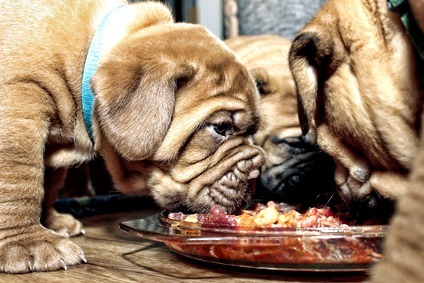 Choose only fresh, human-grade meat for your raw puppy food diet and don't feed old/spoiled/past-its-sell-by-date meat. Dogs have strong stomach acid but they can still get sick from bacteria laden food. You can buy meat from your local grocery store, butcher or meat market. Ask an assistant in the meat dept. about getting the meaty bones, most are happy to help. There are also a number of online sources for top quality raw meat, offal, and meaty bones. You can order from the comfort of home and have everything shipped to your door. Wild game/fish are also valid options, but the meat may be contaminated by parasites such as worms. Freezing this type of meat for three weeks will kill any parasites and make it safe for your pup to eat. 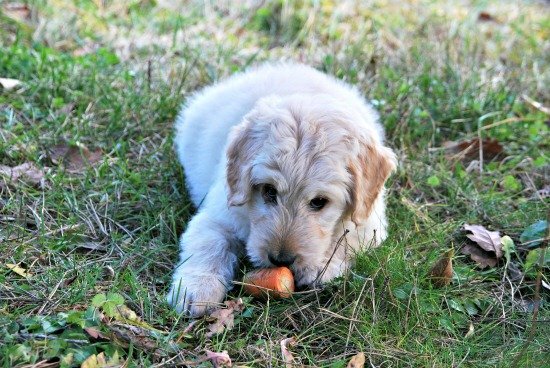 There's a huge variety of meats you can feed, and varying them from day to day and week to week (and doing the same with many of the other ingredients of your puppy's raw meals) will help ensure little Rascal gets a well-balanced diet. You can feed game such as rabbit, wild fowl, deer, bison, trout and so on, but remember to freeze it for at least three weeks before feeding it to your puppy/dog to kill off any parasites it may be harboring. Freezing will kill any parasites and make it safe for Rascal to enjoy. The heart is a muscle and an organ. In a raw puppy food diet it's generally included with the muscle meats but is unique in it's composition and nutrients. You need to use common sense when feeding raw bones to your puppy. Obviously the smaller the pup the smaller the bones need to be. You want little Rascal to be able to chew them up properly so that he's not swallowing big chunks, or breaking his teeth in the attempt. Large breed puppies can handle bigger bones than small breed ones, and as any puppy grows so will the size of the bones he can be fed. Every pup is different and your little Rascal may be a 'gulper', a chow-hound who tries to swallow everything whole. If this happens when you're feeding raw puppy food you'll need to experiment with the types of bones you offer. Maybe go larger, offer a chicken quarter rather than chicken wings, or go smaller. Supervise him very carefully to prevent choking. Whatever raw meaty bones you're feeding your pup, the most important thing is NOT to have them small enough for him to swallow whole. This increases the risks of choking. The bone/s should have to be gnawed, crushed and broken down in order for them to be swallowed. In this situation go bigger rather than smaller. Some puppies are determined to inhale their food regardless, if your pup turns out to be one of them you may be better to offer him meat OFF the bone for safety's sake, at least until he's a little bigger. You still NEED to feed the bone, so in this situation you can grind them up in a meat grinder and add them to his food that way. Bone is an essential part of a raw puppy food diet, without raw bones the diet is totally unbalanced and not a good option. Ground egg shells are also a great natural source of calcium, but aren't a replacement for bone. 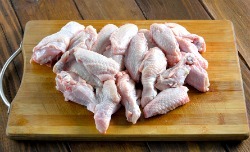 Wings, thighs, drumsticks, whole legs, backs or necks from chickens, turkeys, ducks and so on. Pork riblets, or pork, lamb or beef ribs are good. Offer pieces which contain between two and four ribs. Beef neck bones and windpipe. 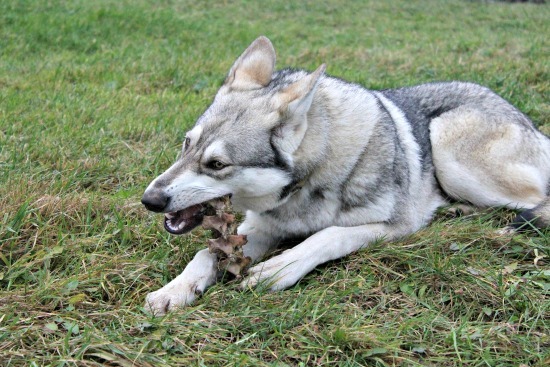 The 'big' bones such as beef knuckle bones, marrow bones, femur bones or hip bones aren't suitable for raw puppy food recipes, but can be given as 'recreational bones'... for chewing, gnawing and as a nutritious toy. Supervision is always necessary with recreational bones to make sure your pup doesn't chew chunks/sharp pieces off the bone, or damage his teeth. Although lungs aren't exactly muscles, they aren't exactly organs either (from a physiological standpoint). In raw feeding they're generally included in the organ category. To stick as closely as possible to a natural raw diet try to make sure all meat in a specific recipe is from the same animal, for example use chicken liver or organs when feeding chicken, cow organs when feeding beef etc. If your raw puppy food diet of choice is the Prey Model, these are all the ingredients you need. For the BARF model there are several other things you will be adding to Rascal's meals. These can include vegetables, fruit, dairy, eggs (including the shells) and supplements. Vegetables and fruits are a good source of essential vitamins, minerals, antioxidants and fiber. They also provide plant-based protein in a raw puppy food diet. But dogs don't have the ability to digest raw vegetables very easily, and the veggies which are considered safe and appropriate to feed to your dog are limited. Dark leafy vegetables like spinach or kale can be given, but in small amounts. The same goes for cabbage. To make sure your pup gets the most out of his veggies it's best to put them through a blender or juicer. The raw vegetables listed above won't hurt your pup if you feed them whole, but they won't do him much good either. Pureed, liquidized or juiced is the way to go. You can feed pieces of raw veggies as treats, but when they're part of a meal then follow the directions above. Do NOT feed grapes as these are toxic to dogs. Fruit can be blended or juiced, but if it's nice and ripe that's not necessary. Now comes a selection of ingredients which aren't strictly necessary in a raw puppy food diet, but each one is a source of important nutrients and helps to ensure a balanced diet. Eggs are a versatile whole food, an excellent source of protein, and also provide important vitamins, minerals, enzymes and fatty acids. As well as adding raw egg (yolk and white) to your raw puppy food recipes the shells can included too. Just wash them, dry them thoroughly, crush them to a fine powder and sprinkle into the food. Yogurt is a good source of probiotics, so is Kefir. Cottage cheese or ricotta cheese can be given in small amounts. Because dogs often can't digest cow's milk very well, you can also try goats milk products. Legumes are plants of the pea family, and their seeds are found in pods. They include beans of all types and are tiny protein power-houses. If you use sprouted legumes so much the better as these are even more nutritious. This category is the most complicated, and probably the one most debated among the supporters of raw dog food diets! If you're feeding your pup the Whole Prey Diet, or all of the above ingredients, in rotation and in the right ratio, then your puppy should be getting everything he needs nutritionally and shouldn't NEED any supplements. BUT, it's difficult to be sure that you are in fact balancing out the nutrients properly over a period of days/weeks. Adding a few basic supplements to some of your puppy's meals can take away the nagging worry that you're 'missing something'. Moderation is key, and too little is better than too much (as long as you're using a wide variety of quality raw ingredients). Fish oil/Cod Liver oil when you're not feeding fish. Here's a quick look at the nutritional, vitamin and mineral content of some of the major ingredients in a raw puppy diet. Hopefully it will help you to figure out what, if anything, your Rascal's raw food recipes are lacking and make supplementing easier. Raw meat is the best possible source of protein and essential amino acids for your pup. Meat, even lean cuts, contains some fat. It also contains small amounts of some vitamins and minerals including sodium, potassium, zinc, magnesium and iron (beef contains more iron than other meat sources). Organ meat (aka Offal) is another excellent source of protein and other important nutrients. 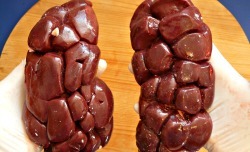 Liver is the most nutritious organ because it contains a lot of different vitamins, minerals and fatty acids. These include Vitamins A, B1, B2, B3, B5 and B12 as Folacin, Biotin plus a few others B vitamins as well as Vitamins D, E and K. Minerals including Zinc, Iron and Selenium and Omega-3 and Omega-6 fatty acids. Tripe contains some very important nutrients including Omega-3 and Omega-6 fatty acids, enzymes, phytonutrients and some probiotics. Kidneys also contain protein, fatty acids, vitamins B, C, D, E and K plus Zinc. Heart is similar in nutritional value to kidney but also contains Taurine, an essential amino acid. Green Tripe is a great source of essential fatty acids, as well as many plant-derived nutrients due to it's original function in a herbivore's digestive system. Raw bones are a powerhouse of nutrients and are a source of protein, fat, fatty acids, marrow, iron, anti-oxidants. They're also an essential source of minerals including the all-important calcium and phosphorous. Of course there are lots of different types of veggies, and each one has it's own nutrient profile. They're all excellent sources of fiber. Here's a quick look at just some of the most popular ones... Carrots are a rich source of vitamin A from Beta-carotene, B vitamins plus E and K. Also minerals including Copper, Iron and Potassium. Brussel Sprouts contain vitamins B1, B6, B9 (Folate) C and K, along with minerals including Potassium and Copper. Green Beans contain vitamins A, B1, B6 and E, plus minerals including Copper, Calcium, Magnesium and Potassium. Also Omega-3 fatty acids. Sweet Potatoes provide a good dose of vitamin A (from Beta-carotene) and vitamin C. They also contain vitamins B1, B2 and B6, plus Copper, Potassium and Phosphorous. Broccoli is a nutrient-packed vegetable and is a great source of Vitamin A (from Beta-carotene), B1, B6 and E and Omega-3 fatty acids. Plus minerals including Magnesium, Zinc, Calcium, Iron, Copper and Selenium. Celery is a source of vitamins A (from Beta-carotene), B2, B6, C and K plus it contains minerals including Potassium, Iron, Magnesium, Copper and Calcium. As a whole, fruit is a rich source of many vital nutrients including vitamins, minerals, anti-oxidants, enzymes, fiber and of course, natural sugar (which provides energy). Each individual fruit has it's own nutritional profile in terms of vitamin and mineral content. Here is a quick overview of the main vitamins and minerals in each type of fruit... Pear - vitamins B1, B2, B6, C and Potassium. Apple - vitamins A, B1, B2, B6, C, Potassium, Folic Acid, Magnesium. Orange - vitamins A, B1, B2, B6 and as we all know, vitamin C. Also Potassium, Calcium, Thiamin and Magnesium. Watermelon - vitamins A, B1, B2, B6 plus Iron, Magnesium and Calcium. Blueberries - vitamins A, B6, C and K. Plus Magnesium and Iron. Cranberries - contain vitamins A, B6 and C, plus Iron and Magnesium. They're also very high in antioxidants. Strawberries - vitamins a, B1, B2, B6 plus vitamin C. Bananas - are rich in B6. They also contain B1, B2 and vitamin C, plus Potassium, Magnesium and Folate. Eggs are a wonderful source of protein for your pup. They also contain Calcium (both in the yolk and in the shell), Lutein, Choline, Lecithin, Omega-3 fatty acids, Vitamins B, D and E, Zinc and amino acids. Milk is a prime source of Calcium. Yogurt provides important probiotics and is a source of Calcium and Potassium. Cottage cheese is a good source of protein and also contains Vitamins A and D plus minerals such as Iron, Potassium, Magnesium, Selenium, Zinc and of course, Calcium. Legumes are nutrient dense and are a healthy source of protein, fiber, fats and a range of vitamins and minerals. They contain a range of B vitamins including B1, B3, B5 and B6 plus minerals including Iron, Magnesium, Potassium, Zinc, Copper and Manganese. As I said earlier, it's not practical to expect to create individual raw puppy food meals that are always perfectly nutritionally balanced. Aiming for nutritional balance over a period of a week or two is much more do-able and perfectly acceptable. However, in terms of the balance between muscle meat/organ meat/raw meaty bones/vegetables/fruit/other ingredients in each meal there is a fairly specific ratio that you need to follow. The Whole Prey Diet (WPD) is slightly easier than the BARF model in terms of balancing ingredients because meals consist entirely of raw meat (in all it's forms). Because each animal/bird has a different ratio of bone:meat, feeding a variety of different carcasses means that over time your pup is going to be getting the right balance. The other difference between the two models is pretty clear from the name 'Whole Prey' and if you feed this particular type of raw food diet then you can include whole prey at some meals. A whole animal or bird carcass provides the ultimate in naturally balanced nutrition as it contains all the types of meat listed above. Obviously it's not practical to feed little Rascal a whole cow, sheep or pig... but adult dogs can manage rabbits, ducks, chickens, quail and so on. A puppy can usually handle cornish hens, baby chickens, squirrels and other small mammals (wild-caught prey should always be frozen for at least three weeks to kill of any parasites it may contain). If you imagine the type of prey a dog the size of your puppy would be catching in the wild, that is what he would naturally be able to eat safely. There is a second type of Whole Prey Diet called 'Franken Prey' which is different from both the original WPD and BARF. The Franken Prey protocol differs from the original WPD because you feed your pup raw muscle meat and organs and raw meaty bones rather than a whole animal carcass. It's also different from the BARF model as instead of feeding both types of meat and meaty bones from one specific animal at each feed, you can feed meat from multiple different animal sources at any one meal. Whichever figures you choose to use the total needs to add up to 100%. Although those percentages need to equal 100%, that figure relates to the meat portion of the meal only. Using the BARF model you will also be adding vegetables and fruit, and other ingredients such as eggs or dairy and so on. There's a little more flexibility here too because raw dog food enthusiasts and experts don't all agree on the exact proportions of meat/vegetables/fruit/additional ingredients. But they are all fairly similar. I don't want to confuse you with all the possibilities, so let's take an 'average' meal template. Following this guideline will help ensure that your little guy is getting raw puppy food that contains all the nutrients he needs. Obviously there are a variety of meats, vegetables and fruits to choose from and it's important to offer the whole range of options over a period of two to three weeks to avoid any nutritional 'gaps'. Use the info. given for the vitamin/mineral content of raw ingredients earlier in this article to help you choose choose those that compliment and balance each other. The guidelines for feeding raw puppy food are very similar to those for feeding raw dog food, but there are a handful of extra things you need to be aware of with puppies. 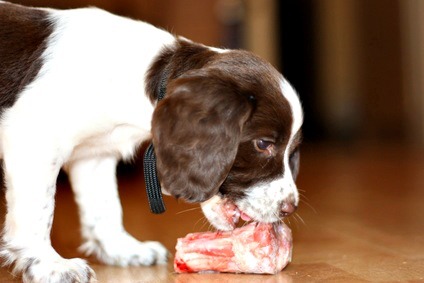 Raw meaty bones are a hugely important part of a raw food diet for puppies and dogs. Most puppies can handle raw bones that are a suitable size for them. Not too small, and not too big, although bigger is better than smaller! It's a good idea to start out with chicken/turkey bones for a young puppy. A smaller pup may do better with just part of a chicken wing to begin with, larger pups may handle the whole wing or the back portion. Giving your little Rascal space, and peace and quiet to eat, can help reduce any tendency to gulp or gobble down his food. Raw meat and bones are so appealing and precious to dogs and puppies that they often try to protect them from other pets or the humans in the family... and they think the best way to do this is to eat them up FAST. Obviously this isn't what is best, so just give your pup some space but supervise from a distance to make sure all is going down as it should. When starting Rascal out on a raw puppy food diet, choose one source of protein (ie chicken, lamb, beef etc.) and feed all meat and bones from that single source for 7 - 10 days. As long as he doesn't have loose stools or digestive upset at that point you can introduce one new protein source, and follow the same protocol. Over a period of six weeks or so you'll be able to get him familiar with the majority of different meat products. Organ meat (including liver) is very rich and can cause loose stools when it's first introduced into the diet. If this happens, lower the percentage of organ meat in Rascal's meals and work back up gradually. This usually eliminates the problem. Feed puppies under three months old four times a day. Between four and six months, feed three times a day. Between six and twelve months, feed puppies twice per day. Small and medium breeds can be fed just once a day (if you want to) after they reach one year old. Large and X-Large breeds can be fed twice a day up until eighteen to twenty-four months. After that point once per day is fine, if you want to. Puppies (and dogs) should have access to plenty of fresh, clean water at all times. The only exception to this is for young puppies who are learning the basics of house training. For them, if necessary you can pick up the water dish at around 8pm to help them train their bladders overnight. Puppies who are eating raw meaty bones DO NOT need any calcium supplements. Too much calcium can cause serious bone/skeletal issues in growing puppies, especially large breed ones. Not every single meal has to contain bone and it's okay to add ground eggshell to meals that don't contain any bone, at the ratio of 1/2 tsp to 1lb of meat. 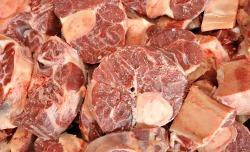 However the vast majority of meals should contain raw meaty bones because of their unique and essential nutrients. Whether you feed raw puppy food, a home cooked diet or commercial puppy kibble, figuring out how much to feed your little Rascal can be a challenge. Guidelines are just that, a guide, and are designed for the 'average puppy'... and of course, no puppy is average! You can't measure raw food in cups or scoops the way you do with kibble, but you can still measure it fairly accurately in an entirely different way. To figure out how much raw puppy food your pup needs per day, you calculate it according to his age and his weight. Once you have a figure to work with, divide it up into the number of feeds you are giving daily. * Large and giant breed puppies may need to be fed at the 6-12 month level for up to 18 months as they mature more slowly than smaller breeds. Remember the above guidelines for feeding raw puppy food are just a guide, your puppy is a unique individual and may need more, or less, than these recommendations. The real guide to how much your little Rascal needs takes into account his appetite, activity level, overall health and weight gain/body composition. I'd recommend having your veterinarian check him out in terms of health and weight from time to time just to make sure you're on the right track. A healthy puppy should have a light covering of fat across the ribs (you can feel the ribs individually, but not see them clearly), bright clear eyes, a shiny coat, healthy skin and plenty of energy. Experts disagree as to whether it's necessary, or even advisable, to supplement a raw diet (whether WPD or BARF) and I can't tell you whether you should do it or not. This supplementation decision is best made once you have a clear picture of the diet you're comfortable feeding your puppy, and you've taken into account his ingredient preferences, appetite and health. If you feel your puppy isn't getting enough of a particular nutrient, vitamin or mineral, check the list of Vitamin/Mineral Content table earlier on this page and increase his intake naturally by adding more of the foods which contain the nutrients you're looking for. Only turn to supplementation if you're sure your pup is not getting enough through his diet, and discuss it with your veterinarian first for recommendations and suggestions. It's important to realize that even if you choose to use supplements, you don't need to add them to every meal, or every day. Adding them three or four times a week should be plenty. These essential fatty acids are very important and keep many of your puppy's systems humming along happily. The very best source of Omega-3 fatty acids are fish and fish oils. Certain Omega-6 fatty acids can be found in some vegetable oils including Safflower, Sunflower, Corn and Canola. Evening Primrose oil also a great source for these. The easiest and best option for adding essential fatty acids to your raw puppy food recipes is to use fish oil supplements containing both Omega-3's and Omega-6's and which are specifically formulated for dogs. A ballpark estimate for dosing is 1000mg per 30lbs of bodyweight, but pay attention to the instructions on the label of whichever product you choose to use. Because Omega-3 increases the body's need for antioxidants, if you supplement this way you may also want to add Vitamin E , or choose a fish oil that contains vitamin E also. Like most animals, our dogs can't manufacture their own vitamin C and as this nutrient is important for the immune system, you can supplement if you're worried that the raw puppy food diet you're offering isn't supplying enough C.
Choose a product that is in the form of Calcium Ascorbate (not Ascorbic Acid) because it's easier for your pup's body to handle. You can give approx. 200mg Vitamin C, or follow the directions on the product of your choice. Vitamin C is water-soluble and the body naturally excretes (in urine) any excess. But if you give way too much your puppy will likely have diarrhea. This vitamin is also a diuretic so your puppy may need extra water to drink to make sure he doesn't become dehyrated. This is one of the supplements that is safe and beneficial, and all pups and dogs benefit from some probiotics. You can add probiotics to your puppy's raw diet by adding live yogurt or kefir to his meals a couple of times a week, or choose from a number of probiotic products which are specifically formulated for dogs. You can add some additional nutrients to your pup's diet by adding herbs, or herbal/green blends to his meals a few times a week. Usually these types of blends will contain a variety of herbs and greens including wheat grass, alfalfa, spirulina, barley grass, nettles, kale, kelp and more. Green tripe is a good, natural source of these nutrients and you can increase little Rascal's intake of greens by including green tripe in his raw diet on a regular basis. As with any type of food you choose to feed your pup, there are drawbacks to feeding a raw diet to puppies, or dogs. Whenever you're handling raw meat there is a risk that bacteria such as e-coli or salmonella could make you sick. This is something you need to deal with properly to protect the human family members and all that's needed is sensible, routine hygiene in the kitchen. Children aren't generally especially careful about hygiene and hand washing, so clean the area around your puppy's mouth well after a meal and make sure your children wash their hands thoroughly after playing with, or petting, him. Food guarding can be more of an issue with raw puppy food than it is with kibble. Any pup or dog is likely to want to keep his delicious food to himself! As well as ensuring little Rascal has a safe, quiet place to eat it's important to teach children NOT to approach your pup while he's eating and not to try to take food or bones away from him. Obviously resource/food guarding is a behavior that needs to be discouraged and I'd recommend working with your puppy slowly but surely acclimating him to having people around when he eats and allowing his food to be handled. Hand feeding him regularly is a great way to accomplish this. But take it slow and easy. Your puppy has a digestive system which is perfectly calibrated to handle any bacteria that might be present in fresh, good quality meat. He's not at risk the way humans are. BUT, if you feed poor quality, spoiled or past-its-sell-by-date meat products, or freshly caught raw game he could get sick, possibly seriously ill. Don't take that chance. I talked about this subject pretty extensively earlier in this article (here) and that information is important. Raw poultry bones won't splinter the way cooked bones would, so the 'don't feed chicken bones' rule doesn't apply to RAW chicken bones. When feeding raw meaty bones in a raw puppy food recipe stick to the choices I've mentioned, choose sizes that are appropriate for your Rascal, and supervise him carefully to make sure he doesn't gag or choke while eating them. Very occasionally too much bone, or pieces of bones, can back up in a dog's digestive system and cause a blockage. This is potentially very serious. Symptoms of a blockage like this could include constipation, vomiting, bloating, loss of appetite, panting/pacing and stomach pain. If you notice any signs that your pup isn't feeling well always have him examined by your vet right away. 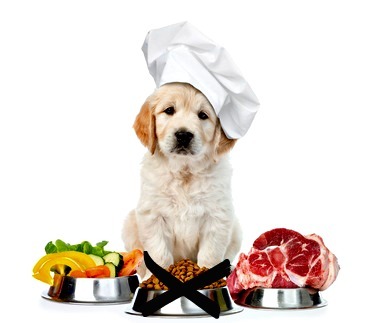 There is a LOT of information about raw puppy food and raw dog diets in general on this page. It's a lot to take in if you're new to the subject. By now you will likely have a feeling about whether or not this is right for you, or whether you want to give it a try, and I hope you found the answers to your questions here. Although a raw diet obviously has some very important benefits, it's by no means the only way to make sure your little Rascal gets a well balanced diet. 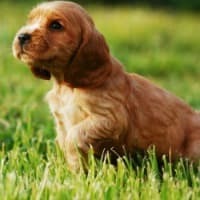 It's perfectly possible to ensure that your pup gets the nutrients he needs from a premium, all natural puppy food, perhaps with a few supplements (as discussed here) added in. Mixing a raw diet with commercial food is not recommended as it can cause serious digestive problems, but which individual route you take is a personal choice and a valid one at that.